A cupcake can be prepared from a variety of formulations and can be decorated with cream and icings. Its composition is not that different from traditional high-ratio layer cakes. The only difference is the cupcakes higher batter viscosity, an important aspect for better processing and baking tolerances. Add all dry ingredients, including fat, in the mixing bowl and mix at low speed for 1 minute, while slowly adding the liquids from the first stage. Scrape down bowl and mix for 4 minutes. Mix for another 1 minute while adding the water from the second stage. Scrape down bowl and mix for another 2–4 minutes at low speed until the required target specific gravity is reached (0.85–0.875). Mix for another 1 minute on low speed while adding the water and vanilla from the third stage. Scrape down the bowl and continue mixing for about another 4 minutes on low speed. The batter can then be deposited into pans/moulds and baked as required. While the above formula describes a recipe for the production of cupcakes using the multi-stage mixing method, commercial-scale production may use different formulations if a continuous mixer is being used. Batter viscosity is important to cupcake production as it will directly affect its baking performance and final appearance. A fluid batter would cause the product to have a flatter top, while a viscous batter would have greater tolerance and result in a rounder top. Extremely thick and highly viscous batters result in cracked peaks and underbaked cakes. Due to their small size, cupcakes require shorter bake time and lower temperatures than regular size layer cakes. Higher temperatures may cause the outside to set too quickly, leaving the inside under baked, or may result in cracks and leaks forming on the surface. Lower temperatures may result in flat top cakes. It is important to balance baking time and temperature to create the characteristic domed top associated with cupcakes. The cupcakes are often filled and/or glazed after baking and cooling to increase variety in the product. Large-scale bakeries using continuous mixing may need to introduce formula modifications such as substituting butter/shortening and eggs with emulsifiers/butter flavorings and egg replacers, respectively to help manage cost. 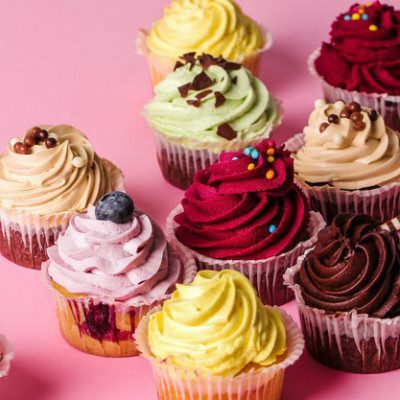 “Cupcake | Definition of Cupcake in English by Oxford Dictionaries.” Oxford Dictionaries, https://en.oxforddictionaries.com/definition/cupcake, Accessed 14 Jan 2019. Leslie, E.. “Cakes – Ginger Cup Cake”. Seventy-Five Receipts for Pastry, Cakes, and Sweetmeats, 9th edition, Boston: Munroe and Francis, 1836, pp. 63. Simmons, A. “A light cake to bake in small cups”. American Cookery. Facsim. Ed., 1796, pp. 48.